If you weren't aware of it already, we live in a place where the official state food is chili and the official beer of Texas is a bland, lifeless shell of a beverage brewed by a company headquartered in California. What's wrong with this picture? Thankfully, we don't have to play by these rules. We can eat what should be the state's official food, that being true Texas BBQ, and drink local beers that actually have taste. Even better, we can enjoy them together at a new place up the road in Frisco. Open since February, 3 Stacks Smoke & Tap House is built upon the reputation of a man called the "The Rib Whisperer". His story, and that of what you can expect from the culinary side of this particular establishment has been well-covered elsewhere, perhaps no better than on the Texas Monthly BBQ Blog. OK, so what about the beer? Close to forty taps along the back wall offer up the obligatory macros and a few of those faux-craft varieties, but for the most part options favor artisan brews. It appears to be a set menu, given the appearance of only one true seasonal, but style choices are reasonably diverse and there's plenty of local flavor. In fact, roughly a quarter of the total tap count comes from area brewers Lakewood, Peticolas, Rahr, FireWheel and Franconia. If there's one beef (see what I did there? ), it's that draft beers are brought to your table in a chilled glass. That equates to a pint-sized party foul from a beer geek's perspective, but in a place like 3 Stacks craft beer should probably be viewed as more of a convenience. Besides, this is Texas, a place where warming things up usually isn't that much of a problem. 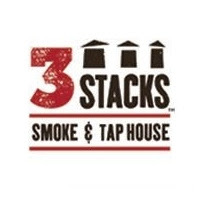 The folks at 3 Stacks also provide a set of cicerone suggested beer and BBQ pairings, a nod to a statement on their website to the effect of loving nothing more than enjoying "smokey BBQ with a nice cold beer". You'll find these conveniently located on the coaster in front of you. That is, as long as you don't spill barbecue sauce all over it first.